Blue Rapids, Kansas is located in northeast Kansas near the junction of the Little Blue and Big Blue Rivers about 12 miles south of Marysville, Kansas. The first endeavor to establish a town below the junction of the rivers was made in 1857 when a town was laid out by James Waller, who lived on Elm Creek, Henry Poor and M. L. Duncan. The town eventually failed due to misfortunes of two of the three participants. However, a post office was established in 1860 which continued operation until 1868. In the meantime the Central Branch of the Missouri Pacific Railroad had built through the area. The next attempt to utilize the impressive water power wasn't made until 1869-1870, when a colony of about 50 families from Genesee County, New York moved in, purchased land and water power rights, and began establishing a community. They bought from R. S. Craft and others a town site of 287 acres, embracing the water power privileges, for $15,000, and secured 8,000 acres of farming lands. The Blue Rapids Town Company was formed and the townsite was laid off on a beautiful level slope extending from the railroad to the river, which was skirted with heavy belts of timber, forming a background of exceptional beauty. Each town lot was sold or distributed on the fixed condition that it never was to hold the foundation for a grog shop or a gaming house of any kind. When the colonists arrived at Blue Rapids, there were no buildings on the town site, with the exception of a small stone building erected years before. The first building erected by the newcomers was a large two-story frame structure which they termed "Colonial Hall." This building was used by the colonists until other structures could be erected, and in it were held the first religious services and the first school. All public meetings were held there, and at one time a portion of it was used as a hotel and the other part for school purposes. Among the first projects in 1870 were a stone dam and a wrought iron bridge built on the Big Blue River. A hydroelectric power plant was then added to provide power for manufacturing and for the town. H. A. Parmalee and Yates Douglass established the first general stores in 1870. W. W. Stevens followed with the first drug store. W. H. Goodwin was the first to represent the profession of law and Dr. R. A. Wells was the first physician in the new town. 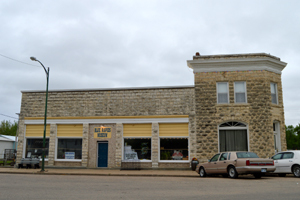 A post office was established in May, 1870 with S.H. Parmalee as the first postmaster. In the summer of 1870, the first school taught in town was held in Colonial Hall by Reverend Charles Holmes. Mr. McPherson and Mr. Reed erected a three-story frame hotel in 1870 which was called the LaBelle (beautiful) House. By the end of 1870 the population was about 250. A King's tubular arch wrought iron bridge was completed in the spring of 1871. In May, 1871, the banking house of Olmstead, Freeland & Co. was established. 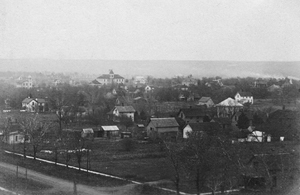 It would later become the Bank of Blue Rapids City. The same year, in June, 1871, Blue Rapids received its first newspaper when W. P. Campbell, and C. E. Tibbetts, purchased the material of the Netawaka Herald and removed it to Blue Rapids, where, on the 4th of July, 1871, they issued the first number of the Blue Rapids Times. Changing hands several times, it would eventually grow to be one of the leading papers in the county. 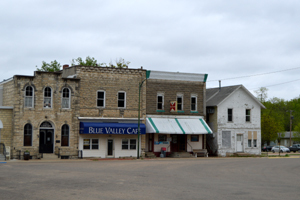 Blue Rapids was incorporated as a city of the third class on March 20, 1872. The first election was held in Colonial Hall in April. C. E. Olmstead was the first mayor. Unfortunately, that same year, the fledgling community suffered a devastating prairie fire on April 10, 1872.. About noon of the day mentioned a dense cloud of smoke was seen to rise back of the bluffs, south of town, and as a strong breeze was blowing from that direction, an apprehension was felt that the town was in danger, which was soon realized by the appearance of flames that came surging down the bluffs with great velocity. The citizens turned out en masse, and seizing everything that would stop the progress of the flames, rushed to the scene. The fire first passed over the railroad track and swept along the west side of town to the river, which alone could check it, leaving a lateral column approaching the town at right angles, which monopolized the exertions of 100 men to keep it in check. The flames also crossed the track on the east side of town and passed on to the river. Here the same efforts were needed, and after all danger was over the gallant fire brigade returned to their homes, blackened, scorched and burnt, but satisfied with their endeavors to save their homes. Due to the water power available, several manufacturing facilities were built in the town's early years including a flouring mill in 1871, a four-story woolen mill and a brick factory in 1872, a paper mill in 1873, a gypsum mill in 1877, as well as a number of foundry and machine shops. In 1873, a two-story brick school building, 30x50 feet with stone trimmings, was erected at a cost of $8,000. Owing to an increased number of scholars, an additional new building, 20x30 feet, was erected in the immediate vicinity. In 1875, a public library was built. Today, it is the oldest library west of the Mississippi River in continuous operation in the same building. It is listed on the National Register of Historic Places. In the meantime, several churches had been organized including the Baptist, First Presbyterian, Congregational and Methodist Episcopal. Many of the congregations utilized Colonial Hall and other public spaces in their first years before new buildings were completed. The first was the Baptist Church completed in October, 1873, followed by the First Presbyterian completed in the fall of 1874, the Methodist in 1876, and the Congregational in the summer of 1882. In August, 1882, the LaBelle House was closed when the partnership between McPherson & Reed dissolved. The Arlington House was opened in the Winter of 1882, by W. Coulter, Jr. in a two-story brick, was erected in 1873 by his father at a cost of $7,000. In 1910, Blue Rapids reached its peak population of 1756 souls. At that time it was second in size among the towns of Marshall County and was considered an important manufacturing point on account of the excellent water power obtainable. At that time, it boasted a glove and mitten factory, four gypsum mines in the area, a cigar factory, electric plaster mills, banks, hotels and city waterworks. The Union Pacific Railroad ran north and south through the community and the Missouri Pacific Railroad -- east and west -- forming good shipping facilities. On October 24, 1913, more than 3,000 fans watched the Chicago White Sox and New York Giants play a world tour exhibition game on the local ball field that is still in use today. Today, Blue Rapids claims to be the smallest town in the U.S. to have hosted a national league baseball game. Like so many other small Kansas towns, Blue Rapids population gradually fell over the years and today is called home to about 983 people. /Legends of Kansas, updated May, 2017.